Is there a standard way of visualizing screens and actions? Is there anything like a standard way of visually representing e.g. a web application in the context of the number of screens, how those screens are connected, and what actions are available from those screens. Ideally it'd be granular enough that there'd be some distinction between an action that opens and takes place in a modal dialog, and one that leads to a new screen. In the past I've just made this stuff up, but if someone's already done all the thinking, life would be much easier. 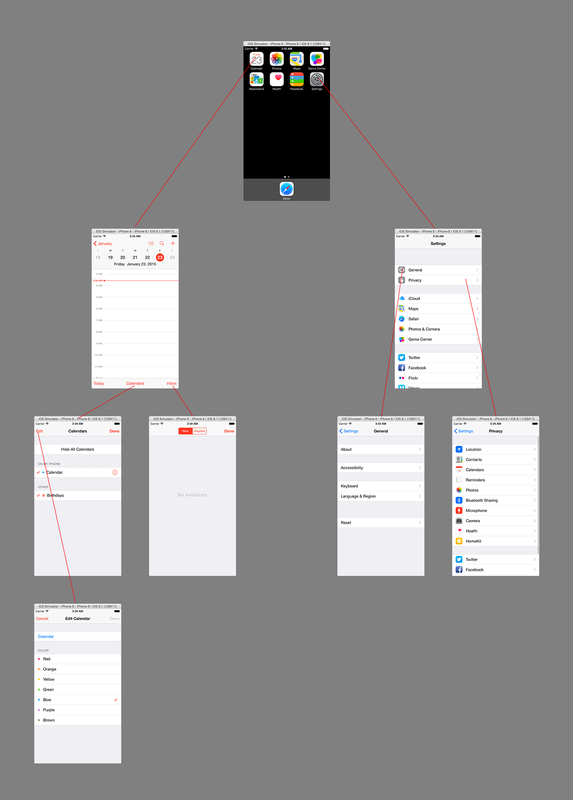 There is no established system from what I've seen for static, two-dimensional screen flow charts, but I would recommend using a hierarchical system with different screens as top nodes, and actions for each screen as children of the node. Then connect the top nodes from the actions which take you there. Here's a quick and ugly example below. They don't even have to be so linear, they just need to be clustered together. If you're not talking about static 2D, then there are plenty of options out there for mockups. Not the answer you're looking for? Browse other questions tagged info-visualisation sitemap content-audit or ask your own question. Good way to visualize complex AND/OR query/criteria? Best way to show Readonly and Writable cells in a grid?